This is the confidence which we have before Him, that, if we ask anything according to His will, He hears us. And if we know that He hears us in whatever we ask, we know that we have the requests which we have asked from Him. Before leaving for Korea, I also prayed three very specific prayers: 1. That God would help me find a missionary to fellowship with 2. To help me start a Bible study for soldiers 3. To give me a man to disciple. Within the first week I met a missionary named Ray Massey who was willing to meet once a week for accountability and fellowship. Within two weeks I started a small Bible study with about eight people. And within three weeks I was discipling a guy named Kevin. God had answered all three of my prayers and I started to see how God could use my life in building the Kingdom apart from the safety net of the Fort Campbell ministry. My vision for personal ministry was tested in Korea and it was the foundation for ministry in the future. 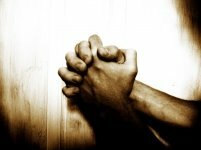 I think one of the secrets to answered prayer is to pray the things that are most closely related to the matters on God’s heart. I was praying that He would use me in His Kingdom and the spreading of the gospel. Jesus is certainly excited about helping us accomplish His work! Testimony 12: What about You?